Right at the upswing of their business, the bombing of Pearl Harbor on December 7, 1941, interrupted the business and the country entered into a world war. The construction industry came to a halt and the only work available were government-sponsored jobs related to the war effort. With the drywall housing industry dead, the company closed down. 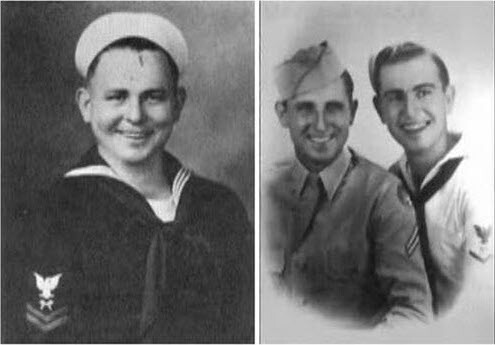 By December 1942, John L. had joined the Navy and served in the Construction Battalion, the so called, “Sea Bees”. He saw duty in the Pacific at New Georgia, Russell Islands, Guadalcanal, New Caledonia, and Pelilu. Bill enlisted in the Army Air Corps in March of 1943, as an aircraft mechanic, served in New Guinea, and then spent some time in Tokyo after the war. Ralph joined the Navy in September 1943 and was stationed in Corpus Christi. When John L got his discharge on December 10, 1945, he immediately returned to Houston to re-establish his business and marry Frances Hanel. Ralph married Martha Nolz while still in the military, who was a nurse Lieutenant at the naval base in Corpus Christi in August of 1945. They stayed in Corpus Christi for a while after leaving the military before moving back to Houston to join his brothers again in the drywall business. Bill discharged from the Army on January 6, 1946 and right after joined his brothers in the drywall business. Bill got married to Bessie Sliva in May 1946. All three of the brothers had the idea of settling down and raising a family when they returned home, which was the case with many of the soldiers. They took their enlistment in the military with honor, as did so many other men and women. Many lost their lives for the freedom that America stands for. God must have had greater things in mind for them as all three Mareks did their tour in the military and returned home safely. Houston was still the booming city it once was before the war. Marek Brothers Sheetrock joined the boom and helped build Houston into the major metropolitan area it became in the mid-1950s. Builders had come to rely on the company’s reputation for reliability and quality work with drywall hanging. Houston’s economy was doing very well mainly because of the petroleum and related industries. Houston’s petroleum industry received large subsidies from the government because of its strategic importance. After the war, consumer-buying power was at an all-time high, although the construction industry and commerce had a hard time keeping up with the demand. One of the major shortages at the time was housing. For the Marek’s, timing could not have been better. Contractors were putting up houses, as fast as they could build them and they all needed drywall. One major problem they faced was the shortage of skilled workers who knew how to hang drywall. Most people were not willing to work the long grueling hours that the brothers demanded in order to keep up with the jobs they had. They demanded 12 to 14 hours a day of hanging drywall, which the brothers found easier hanging it themselves. After Bill and Bessie returned from their three-day honeymoon, a cousin joined them in their company. Bob started out working for 80 cents an hour and stayed with the company for his entire career. He formed the first floating crew and became an authority on how to turn out a first class job. He eventually became the General Manager of Oak Forest Lumber and Supply, which provided materials for the whole company. While John L. and Bill were building the company, Ralph was still living in Corpus Christi managing the Officers Club and selling insurance on the side. Ralph was making a very good living at what he was doing. He bought a nice three-bedroom home in a pleasant subdivision and Martha gave birth to their son, Stan, in 1947. Martha was very comfortable living in Corpus Christi and was not interested in moving to Houston, although, John L and Bill had different plans for Ralph. They were trying to convince him to join them in the business of hanging drywall. They wanted Ralph to help manage the company, which he had proven to be good at with the two clubs he managed with the Navy. He finally agreed to join his two brothers and on January 1, 1948. He loaded up his car with Martha and their son, Stan and left Corpus Christi for good. However, before moving to Houston Ralph got a commitment from John L and Bill to replace the house he had in Corpus Christi. They all pitch in to help build the house, which was hard work, but the effort was worth it. They mixed the concrete by hand for the slab and driveway. The house was finished in 34 days at a cost of $4,623.